(The following has been updated for 2019.) Merit scholarships from colleges aren’t simply a way for schools to reward students for accomplishments, it’s part of the supply and demand of paying for college. Colleges use merit aid as a way to increase the supply of “accomplished” students at their schools. This is why the most competitive colleges in the country such as Princeton and Harvard don’t offer merit scholarships–they have no problem attracting high achieving students to their schools. In general, merit scholarships or aid is associated with private schools (See 4 Easy Steps to Find 254 Colleges for Potential Merit Scholarships). Most students that would qualify for merit aid at a private college will find that their state flagship universities aren’t worried about providing incentives to attend them. Like the most selective schools in the country, they aren’t hurting for quality students since they charge so much less for tuition. However, there are some public universities where students are more likely to receive merit scholarships than others. Some colleges may do this so that they can raise their academic reputation in the state. Some are trying to keep students from leaving the state and others are trying to convince out-of-state students to come to fill spaces. Therefore, students who know that they aren’t likely to qualify for need-based aid at their public universities, might consider such schools. The list below shows 54 50-50 schools where at least 40% of freshman received non-need based aid according to data publicly available from the Common Data Set. You need to be careful using these numbers. The main reason is that they can be very wrong. For example, the University of Kentucky reported 4,758 freshman on its 2017-18 CDS form. It also listed that 5,107 freshman without financial need were awarded institutional non-need scholarships or grants. The University of Utah has a similar error. According to its publicly posted CDS, they had 1,934 freshman without need (Freshman minus the number who had need) but they had awarded non-need aid to 2,164 freshman without need. These are obviously data errors of some sort and I sincerely don’t want this to be used as an excuse for colleges not to post their CDS information. But the fact is that families need to be careful in using this and any information from these reports. As far as I know, colleges aren’t paid for the time it takes to compile the data and it isn’t used to meet any regulatory requirements. Since it’s being used by publishers to make money, my guess is that the colleges’ primary motivation is publicity. But if you think about it, none of this lends itself to strict data quality standards. 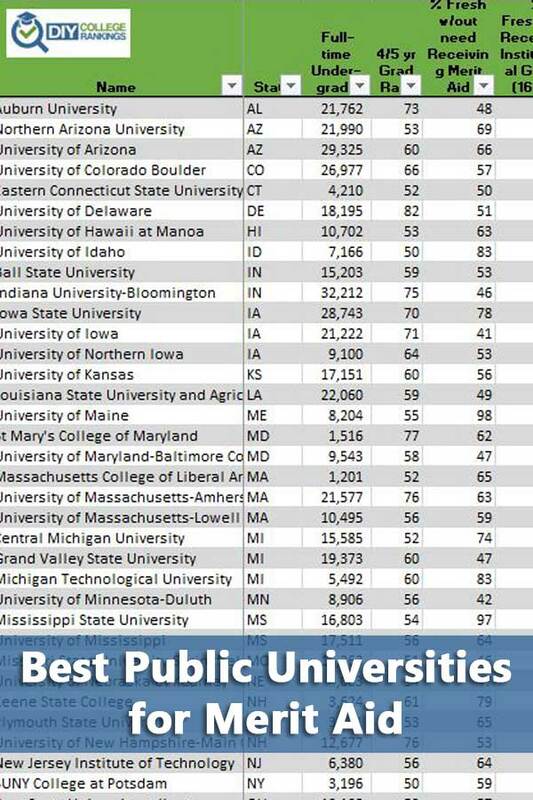 And yet here I go offering the data available because who doesn’t want to know which public universities offer the most merit scholarships? I just hope Utah and Kentucky figure out their data errors soon and I very much appreciate them posting their Common Data Sets. Ultimately, chances are the schools on the list below are contributing significantly to merit aid based on the percentage of freshman receiving institutional aid. These schools tend to have a higher percentage of freshman receiving institutional grants, an average of 70% compared to 54% for all public 50-50 colleges. The higher the percentage of freshman receiving grants, the more likely that students without need are getting some of the money. There are 34 states that have colleges on the 50-50 Public Colleges for Merit Aid list, up from 27 from last time. This could just be from an increase in the number of universities posting their Common Data Sets. South Carolina and Pennsylvania have the most with four each. Iowa, Massachusetts, Michigan, New Hampshire, and Ohio tied for second with three each. The table below lists 50-50 public universities where at least 40% of freshman without need received merit aid. 50-50 schools accept at least 50% of students and have at least a 50% graduation rate. As usual, for 50-50 schools the five-year graduation rate is used for public schools. All of this information is part of the DIY College Rankings Spreadsheet.